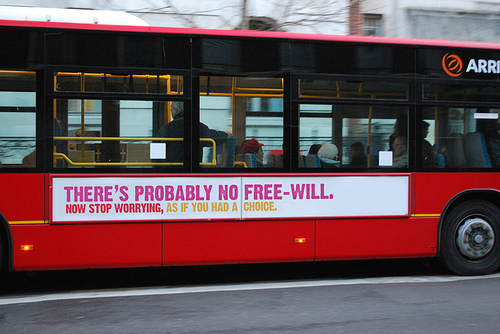 Free Will - Get Over It. Or not. So. Do we have free will or not? 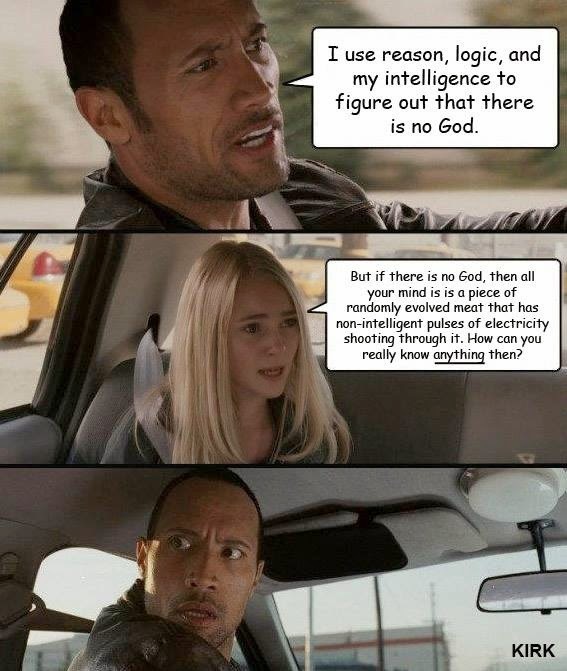 We (really really)(are totally compelled by the lack of free will to really really) want to know. We should maybe read all of the very latest highly intelligent totally informed scientifically science stuff about it. The sciences have grown steadily bolder in their claim that all human behavior can be explained through the clockwork laws of cause and effect. This shift in perception is the continuation of an intellectual revolution that began about 150 years ago, when Charles Darwin first published On the Origin of Species. Sir Francis Galton began to draw out the implications: If we have evolved, then mental faculties like intelligence must be hereditary. But we use those faculties—which some people have to a greater degree than others—to make decisions. So our ability to choose our fate is not free, but depends on our biological inheritance. Galton launched a debate that raged throughout the 20th century over nature versus nurture. 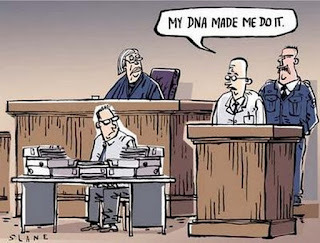 Are our actions the unfolding effect of our genetics? Or the outcome of what has been imprinted on us by the environment? Impressive evidence accumulated for the importance of each factor. Whether scientists supported one, the other, or a mix of both, they increasingly assumed that our deeds must be determined by something. In recent decades, research on the inner workings of the brain has helped to resolve the nature-nurture debate—and has dealt a further blow to the idea of free will. Brain scanners have enabled us to peer inside a living person’s skull, revealing intricate networks of neurons and allowing scientists to reach broad agreement that these networks are shaped by both genes and environment. But there is also agreement in the scientific community that the firing of neurons determines not just some or most but all of our thoughts, hopes, memories, and dreams. desired effects. The same holds true for brain structure: Cases of ordinary adults becoming murderers or pedophiles after developing a brain tumor demonstrate how dependent we are on the physical properties of our gray stuff. ourselves as shaped by influences beyond our control. But it left some room, at least in the popular imagination, for the possibility that we could overcome our circumstances or our genes to become the author of our own destiny. The challenge posed by neuroscience is more radical: It describes the brain as a physical system like any other, and suggests that we no more will it to operate in a particular way than we will our heart to beat. 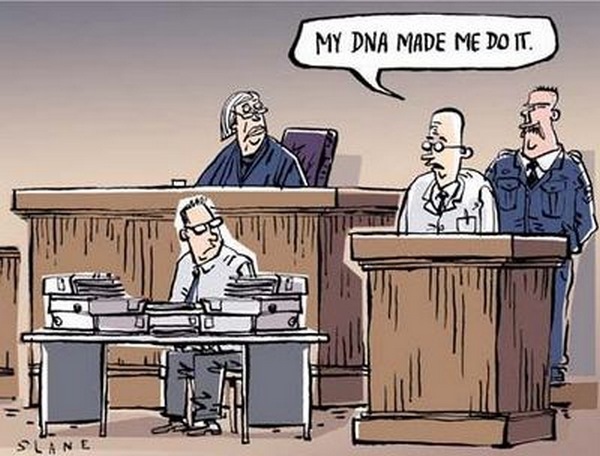 The contemporary scientific image of human behavior is one of neurons firing, causing other neurons to fire, causing our thoughts and deeds, in an unbroken chain that stretches back to our birth and beyond. In principle, we are therefore completely predictable. If we could understand any individual’s brain architecture and chemistry well enough, we could, in theory, predict that individual’s response to any given stimulus with 100 percent accuracy. So there you go. No free will. 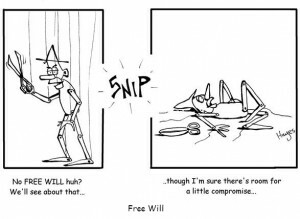 experiment that is often used to argue against free will might have been misinterpreted ... So what does this say about free will? Now, you might say, looking carefully at the dates, that one is 4 years before the other one. So doesn't that mess it all up? No, it means that the Atlantic writer wasn't paying attention in 2012.
to cues or commands, Johns Hopkins researchers found a way to observe people's brain activity as they made choices entirely on their own. For the first time, researchers were able to see both what happens in a human brain the moment a free choice is made, and what happens during the lead-up to that decision -- how the brain behaves during the deliberation over whether to act. The actual switching of attention from one side to the other was closely linked to activity in the parietal lobe, near the back of the brain. The activity leading up to the choice -- that is, the period of deliberation -- occurred in the frontal cortex, in areas involved in reasoning and movement, and in the basal ganglia, regions deep within the brain that are responsible for a variety of motor control functions including the ability to start an action. The frontal-lobe activity began earlier than it would have if participants had been told to shift attention, clearly demonstrating that the brain was preparing a purely voluntary action rather than merely following an order. "What's truly remarkable about this project," said Leon Gmeindl, a research scientist at Johns Hopkins and lead author of the study, "is that by devising a way to detect brain events that are otherwise invisible -- that is, a kind of high-tech 'mind reading' -- we uncovered important information about what may be the neural underpinnings of volition, or free will." So once again, free will is back. Last month. Next month? Who can tell? I think consciousness will remain a mystery. Yes, that's what I tend to believe. I tend to think that the workings of the conscious brain will be elucidated to a large extent. Biologists and perhaps physicists will understand much better how the brain works. But why something that we call consciousness goes with those workings, I think that will remain mysterious. The brain, apparently the seat of free will, may forever remain a mystery. Or at least until everyone's forgotten about my having said so. It would not be wise to piss off Harley guys. However. If any happen to be reading this, they'll be the ones with a sense of humor. Harley guys ride Harley Davidson bikes. Harleys (as in, the bikes) are all pretty different. You can get them built to your own specs. 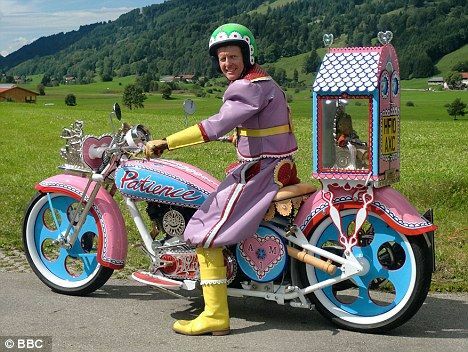 So that, you know, it's not like all the other Harleys. And then you get dressed to ride your Harley. 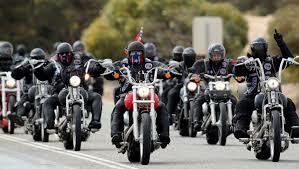 Then you ride off to meet with all the other Harley guys. Might be your own little group from the local Harley hood. 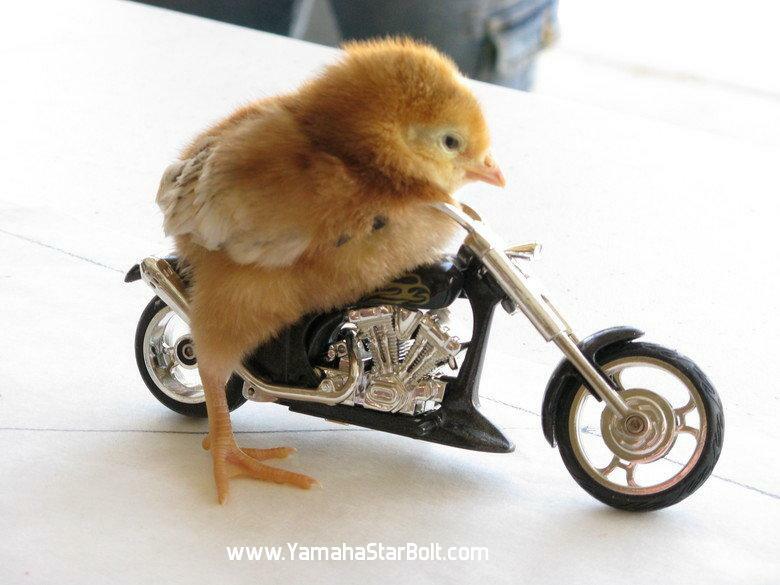 Might be Sturgis. Which is the annual mating grounds of Harley guys. Don't Google Sturgis. Disturbing pics. Harley guys are fiercely individualistic. They set themselves apart from regular guys. They are fiercely different. They are not like anyone else. They stand alone. Fiercely. They fiercely want to look different from all the other guys. Because they want to belong to that group. They want to be a Harley guy. So they gotta ride a Harley and dress like a Harley guy. Even gotta have a Harley chick on the back. And she's gotta dress (or not) like a Harley chick. So here's a subculture that fiercely values free will. Individualism. Freedom. Liberty. The Right To Be Your Own Person. As much or much more maybe than any other subculture in the world. But that's gotta be balanced with the even more fierce desire to belong, to fit in, to look right, act right, dress right. tend to be certifiably nuts. Because if normal people show up to their group of buds and they don't look like the rest of the buds, then the social pressure (as in, making serious fun of the idiotic way they look) is huge and they tend to show up next time fitting into the norms. Even if they are all Harley guys. Because. We all want to belong. To fit in. To be like the people we want to be like. There are (I propose) two things in life that motivate us. One. To belong. To be loved. To be a part of something that is greater than ourselves. Two. To matter. To make a difference. To leave a mark. To leave the world a different (presumably better) place than it was. We want our lives to have a meaning and purpose. And we will largely do whatever it takes to get those two things done. Pavlov. Those are our stimuli. To be loved. To matter. And we will slobber with all the dogs to be loved and to matter. There may be no free will about it. OK, maybe we choose which groups we want to be a part of, but I'm thinking that we are (mostly?)(completely?) influenced in that decision by the experiences we have. For example. I have no desire to be a Harley guy or for my wife to be a Harley babe. Not cool. Totally not cool. But I love to ski. I'm really good. 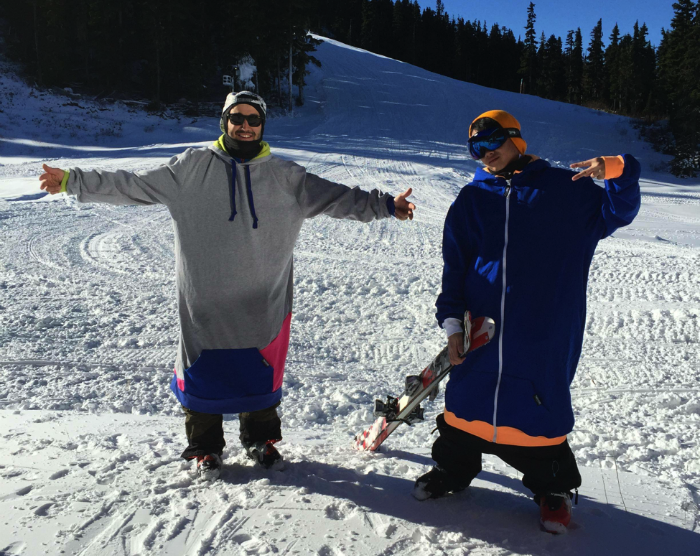 So I want to look like a really good skier. I want to dress like one. I want to have skiis and boots and even poles that really good skiers might have. I want to have a fine-looking ski jacket, and fine- looking goggles, and a cool helmet, and cool gloves, and even (this is true) cool skier long-underwear. Now. If I have all of this cool gear and then I ski like a dork, well, that's not cool. Then I'm pretending to belong when I don't. But I don't ski like a dork. So I get to belong. And my wife is a fine skier. So I have a beautiful ski wife. Awesome. It's the whole package. If I call her a beautiful ski babe or ski chick, I'm going to find one of my ski poles lodged in an uncomfortable place. So I'm not going to do that. So here's the question. If life pulled a Tom Hanks "Cast Away" trick on me and I ended up alone with a volleyball in a deserted ski resort, would I still ski? Am I making a free will decision to ski, or am I doing it because I want to belong to cool skiers? Aye. That's a good question. Because the reasons that I am a skier are 1) my parents took me skiing in Colorado, and then 2) we moved to Switzerland when I was in high school, and 3) skiing was The Thing To Do in Winter in Switzerland, and we had a ski team and I was on it (briefly) and so 4) skiing is totally cool. To me, anyway. by making a free will decision to do so. Curling to me is not cool. It's ridiculous. 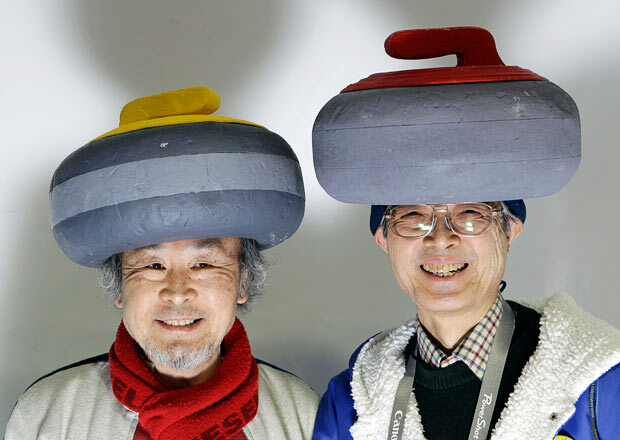 But to curlers, curling is awesome. There might even be curling groupies. 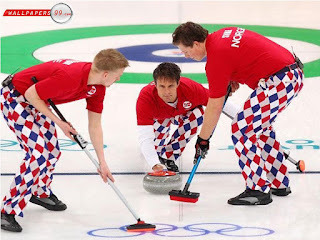 Of course there are curling groupies. 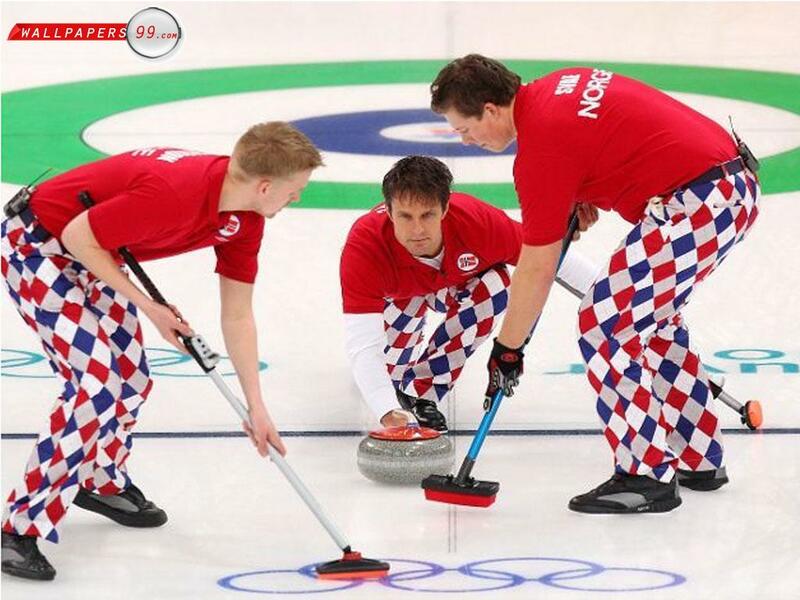 Clearly not a free will decision to be a curling groupie. I'm fully convinced that curling was invented by drunk "people" (meaning drunk "guys") in the Far North who said to themselves one night, what can we do with ice, a big rock, and some brooms? And can we wear ridiculous pants, too? Awesome! Anyway. So the question is, are ALL of our decisions caused by influences outside of ourselves, or just MOST of them? And if it's MOST, then where does free will actually start? So everybody just makes stuff up.